JUST BEFORE THE third bout of the Fine Gael hustings held in Ballinasloe last night, another party member publicly declared their support – this time for Simon Coveney. MEP Mairead McGuinness, first vice-president of the European Parliament said that Coveney had the “grit and determination” to succeed, and was backing him in the leadership race. The final round of the leadership hustings will be held tonight at 8pm. Before the party’s four rounds of debates which began on Thursday, the momentum seemed to be with social protection minister Leo Varadkar, who has almost double his party colleague’s tally. But after the Minister for Housing’s fiery performances in the first three rounds, the race seems much closer than it first appeared (if rounds of applause from party members is anything to go by). The Minister for Social Protection officially launched his campaign last weekend in Dublin, and produced four more confirmed votes (including two ministers) for his leadership-run while he was at it. The big coup for Varadkar was Justice Minister Frances Fitzgerald, who described her colleague as “having magic in the way he thinks” at the launch. Also declaring for Varadkar were Galway TD and Minister of State for Regional Economic Development Michael Ring, Drugs Minister Catherine Byrne, and Senator Joe O’Reilly bringing his total to 46 confirmed votes, still 26 clear of Coveney’s 20. In reaching and passing the 40 mark Varadkar has arrived at what is seen as the magic number regarding support from within the parliamentary party. A victory for Coveney now appears to be a mathematical impossibility, given he would need roughly 70% of the votes of the nation’s Fine Gael councillors in order to win, with the Irish Times’ leadership tracker suggesting Varadkar already has more than 30% of those councillors committed to his cause, with 40% undecided. Varadkar had surged ahead since Enda Kenny stepped down at midnight last Wednesday, gathering the backing of a raft of TDs and senators within days. 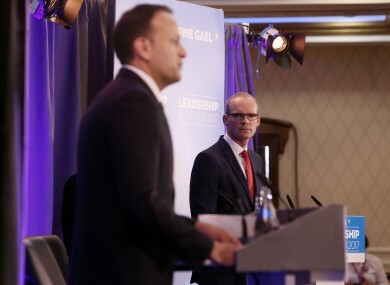 Coveney, meanwhile, launched his own campaign on Thursday – but has struggled to gain the support of parliamentary party members to date. In what has been a relatively tepid campaign thus far, the gloves came off somewhat in Ennis, Co Clare, on Friday with TD Kate O’Connell, a prominent Coveney supporter, labelling those who have opted for Varadkar as “choirboys” who are “boys singing for their supper”, according to a report in the Irish Independent. At the launch on Saturday, Varadkar declined to comment on the “choirboys” remark. Fine Gael’s 73 members of the parliamentary party (that’s TDs, Senators and MEPs) will represent 65% of the total leadership vote. The wider membership have 25% of the voting power and councillors have 10%. With that in mind, here’s a list of parliamentary party members who’ve publicly announced their support for either Varadkar or Coveney. Under Fine Gael party rules, TDs and senators account for 65% of the votes (73 members), while councillors account for 10% (235 members) and general party members make up 25% (almost 21,000). But Ministers publicly backing either candidate could hold sway with local councillors and the party’s membership. Finance Minister Michael Noonan (who announced his retirement on Friday) is still to declare his support for either candidate. The campaign has just under a week left to go, with the leadership result announced by Friday 2 June. Read: The man who would be king – is Simon Coveney on a well-worn path to Taoiseach? Read: From poison chalice to top of the table, is Leo Varadkar destined to be Taoiseach? Email “Day Eleven: Leo Varadkar and Simon Coveney gear up for final hustings debate”. Feedback on “Day Eleven: Leo Varadkar and Simon Coveney gear up for final hustings debate”.